How much damage can Kecleon do with Triple Smash? Help. My opponent claims that Kecleon's Triple Smash can only do 10x2+20 more damage for each heads. However, is it not 10x2+20x2 for each heads? Because Kecleon can be any color his attack is automatically doubled? My opponent claims only the first 10 damage is doubled. Please help us clear this matter up. Thanks. Are you talking about TCG? The attack does 10 base damage, plus 20 for each heads. So, if you flipped two out of three heads, you have the 10 guaranteed damage, 20 damage, and 20 more damage. For two heads, this attack does 50 damage. For one head, it'd only be one 20, and for three heads; three 20s. the 10 at the beginning is the base damage of the attack, meaning if you get NO heads (You unlucky mess! ), the attack will still do 10 damage. Just for clarification, this is your card. Correct? Will: yes that is the card. I don't think your answer takes into account that Kecleon's poke-body allows him to be any color type. Which means if you take the first total damage and apply weakness the opponent's pokemon gets hit with 10+10+20+20=60 per heads. If you apply weakness, does it not double the damage according to the rule book? In some cases you may double and add +20 or x 20! Thanks any way Will. If he changes his type and runs into resistance or weakness damage, then you apply it to the total damage, not each individual attack. 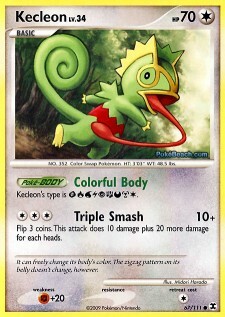 If Kecleon was a Water-type and used Triple Smash on a Grass-type card (Like Weepinbell from R/S Sapphire set, for example), and then landed two heads out of three, resulting in what would normally be 50 damage total, the resistance (-30 Water) would knock down Kecleon's attack to only 20. Thank you, Will...your elaboration has made life easier for us to understand these multitude of rules. Does Protean give Kecleon STAB on anything immediately or does it take effect after the damage has been dealt? What will flying press do to a color change kecleon? Can you soft reset for the Kecleon shop to sell different items? Where can find Kecleon S.S.? In pokemon mystery dungeon, can you recruit the super fast and strong kecleon? Did Kecleon say this because I robbed him in GTI or is it part of the plot? Is a Kecleon Shop no longer a shop after you buy all the items from it?